Stop TPP | "It's NAFTA on Steroids!" We are waking up. The fog is lifting. We are sweeping away the lies and secrecy. The corporate and political leaders of the Pacific Rim nations are meeting in cities across America such as Chicago, Dallas, San Diego, and Leesburg to turn the Pacific Ocean and its peoples into a giant privatized corporate lake characterized by non-union workers, Wal-Mart supply chain feeders, poisoned, landless agricultural laborers, a dying biodiversity, and rising, drowning sea levels. We cannot and will not let this happen. These meetings are officially referred to as the Trans-Pacific Partnership (TPP) Talks. The nations involved are the United States, Australia, New Zealand, Singapore, Malaysia, Vietnam, Brunei, Chile, and Peru. Japan, Mexico and Canada have indicated a desire to join. The economic power of this group is more than 40% larger than the 27-nation European Union. 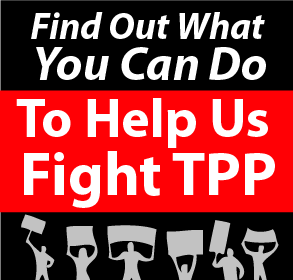 The claimed purpose of TPP is to promote development and create jobs. The General Assemblies of Multiple Occupations across America hereby invite our communities, our regional neighbors, and our co-inhabitants of Earth, in general, to join us in both protesting the TPP and also in creating a new world. 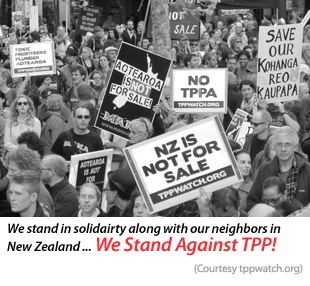 We will march in the streets, with pots and pans, and banners and signs to inform our fellow citizens on what is wrong with the TPP Pact and what are the people’s alternatives.